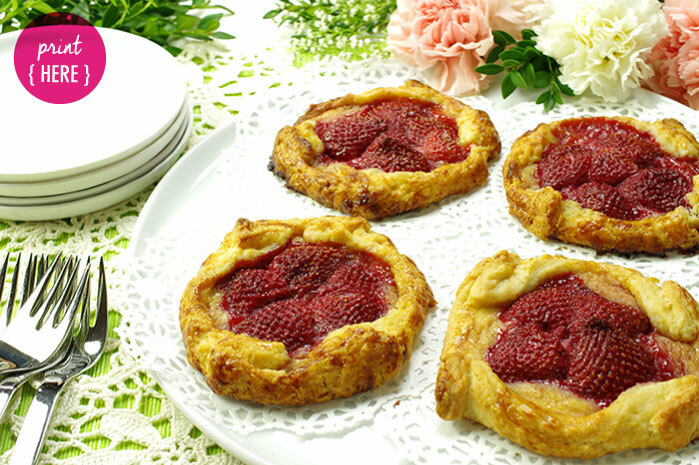 We recently made these galettes in front of a small audience at our local farmers’ market. A few weeks later, a tiny elderly woman approached us in the bakery with a berry-stained copy of the recipe in hand. She peppered us with questions about the process and told us all about the way hers turned out at home. The very last thing she asked us was where to buy mini strawberries. Which made us giggle for days. 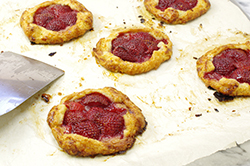 Just to be clear, the galettes are mini, not the berries. 1. 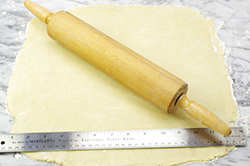 Allow the flaky dough to soften at room temperature for 10 to 20 minutes, depending on the temperature of your house, before rolling. The dough should be cold, but malleable. 2. 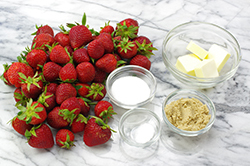 Melt the butter and toss with the strawberries. Set aside. 3. 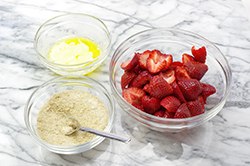 In a separate bowl, combine the brown sugar, granulated sugar, and salt. Set aside. 4. 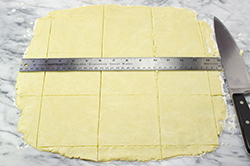 On a lightly floured surface, roll the dough to a 14-in/35.5-cm square, and about an even 1/8-in/3-mm thick. Trim the edges to make them even and slice into nine 4-inch squares (that’s three squares down and three across. Transfer them, evenly spaced, to two greased sheet pans. Press any scraps together and re-roll. You should get at least one more square. If you’re feeling especially efficient, you might get another three. 5. 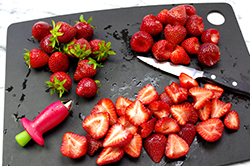 Toss the sugar mixture with the strawberry mixture. 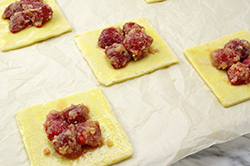 Evenly pile the strawberry filling into the center of each square, leaving a 1-in/2.5-cm border all around. Lightly brush the border with egg wash. Fold the border over the filling like a picture frame. Press the corners to seal. 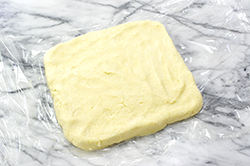 Freeze for at least 20 minutes, or up to 1 month, tightly wrapped. 6. Preheat your oven to 375°F/190°C. When ready to bake, brush the crust with egg wash, sprinkle with sugar, and bake from frozen until deep golden brown, 30 to 35 minutes. Transfer to a cooling rack to keep crisp. Dust with powdered sugar if you’re so moved. These are best the day they’re made, but keep, tightly wrapped, at room temperature, for up to 2 days. We use this incredibly versatile dough at Huckleberry for an insane number of different things. It’s that versatile. We use it for our Thanksgiving pies, crostatas, quiches, chicken pot pies, anything really. When you settle in to make flaky dough, just commit to making three batches. 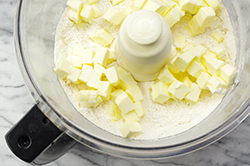 You’ll get into a rhythm and your food processor is going to get dirty anyway. All the recipes in this chapter are a cinch if you have the dough ready, and this batch of dough fits all the recipes in this book. It will keep in your freezer for up to 1 month. Just be sure to double-wrap tightly in plastic. You can absolutely make this dough by hand, but it’s a bit faster in a food processor. 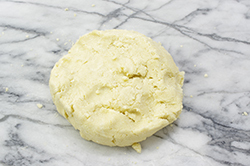 You’ll find that our dough has less water and more butter than most. Big surprise. It may feel as though it’s not nearly enough water, but don’t add more; with faith, a little patience, and some elbow grease it will come together. 1. 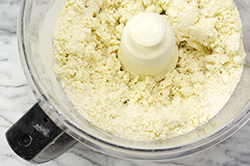 To mix with a food processor, pulse the flour, sugar, baking powder, and salt once to blend. 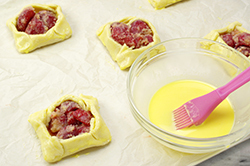 Add the butter to the work bowl and pulse about three times until pea-size pieces form. Pour the water over the flour mixture and pulse another three times until the dough is only just starting to come together. 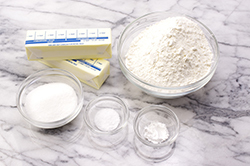 To mix by hand, combine the flour, sugar, baking powder, and salt in a very large bowl. Stir to blend. Add the butter, working it between your finger tips until the pieces are pea- and lima bean-size. Add the water and lightly toss to distribute. 3. 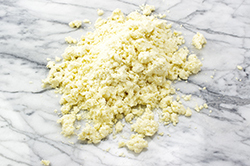 Begin by firmly pressing the entire surface of the dough with the heel of your palm. 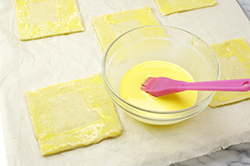 Toss and squeeze the dough to redistribute the wet and dry patches. Repeat, pressing thoroughly again with the heel of your palm, and continue pressing, tossing, and squeezing until the dough begins to hold together. But be sure not to overwork the dough! It should stay together but you should still see pea-size bits of butter running through. 4. Press the dough into a disc 3/4-in/2-cm thick, wrap tightly in plastic, and refrigerate for at least 1 hour, or freeze for up to 1 month. 5. When you’re ready to use the dough, if refrigerated for longer than 1 hour, allow the dough to warm up at room temperature for a few minutes. If frozen, thaw in the refrigerator overnight before shaping. The dough should feel cold to the touch but malleable. Never allow the dough to become too soft or warm. Chill as needed while working. At the bakery, we mix up big batches of egg wash and run through them like crazy. Using an egg wash is an absolute must in many recipes in this book, but the actual recipe for egg wash itself is pretty flexible. You can always use one whole egg instead of the two yolks. And if you have no eggs, you can use just the cream, but it will be a little less shiny. And, finally, if you don’t have any dairy in the house, use the eggs alone. Just make sure to always use the salt. Combine the egg yolks, heavy cream, and salt, and whisk until homogeneous. Refrigerate until needed. This keeps, refrigerated, for up to 2 days.